Many Aboriginal meals are unhealthy because money is tight or community stores charge up to 3 times the price of food in cities. Solutions include licensing stores, making sure children eat their healthy food—or setting up a pool. But assimilation into Western Australian culture drove them into a sedentary way of life and introduced smoking and refined foods. White flour, black tea and white sugar, first offered as rations and payment, became staples along with sugary drinks and other processed foods. Historically, Aboriginal people's songs and dances used to contain clues about where to get food in the environment they were in, and rules of how to to hunt and cook. Since then the hunt for food to survive has given way to the hunt for food that is healthy. Particularly challenging is avoiding food that has been a childhood staple but is now considered harmful, such as damper. Consequently, Aboriginal households either buy cheap (and unhealthy) food or run out of food before the next pay day. From October 2009 to October 2010, 15% of Victorian Aboriginal people had run out of food at some time . Many find it easier to give their children money for fast foods, instead of cooking themselves , encouraging them to make unhealthy choices. Historically, Aboriginal genes are programmed to store fat in the body because food was scarce, especially in dry areas. "We have come from a desert country with genes that preserve everything we eat, but we are not burning the calories we once did in the hunt for food," explains Joan Winch, director of the Marr Mooditj (Good Hands) Aboriginal Health Worker's Training College . If you happen to live in a remote community (only about a quarter of Aboriginal people do) you face another set of challenges. Food prices can be more than triple the price of food in cities. The next supermarket can be an hour's drive and more away, so Aboriginal families buy food only once a fortnight or occasionally. They pick food they can keep in the freezer for convenience, which encourages unhealthy food choices. Providing subsidised fresh fruits can greatly improve Aboriginal health . Educate people. Many Aboriginal people are confused and do not understand what to eat because there is not much education  or they don't understand the labels. There is a need to learn how traditional food cycles, aligned with the seasons of the year, can deliver healthier choices. Encourage community. Community gardens, food shares and hunting and gathering of traditional foods are some things that can contribute to better health . Help people prepare. Community cooking classes allow participants take home the meals they prepared so that families sit together to eat them. Blend traditional ways with contemporary knowledge. Hope for Health, a program developed in the NT, is based on Yolŋu traditional ways and healing methods and adds the best of non-Aboriginal modern nutrition. It helps people master their own lives again and find a balance between both worlds. Reduce sugar. Coca Cola claimed in 2008 that the Northern Territory was their highest selling region per capita in the world. Amata, a community of just 400 people, consumed 40,000 litres of soft drinks in 2007. This is because the way Aboriginal people get food has changed: In 1973 they bought only about 10% of supplies from their local store. Today it is almost 100%, partly because introduced plants have pushed out native grass that attracted animals for hunting. Support the Mai Wiru Foundation with a donation! You might have heard about 'bush tucker', an Australian expression for food from the bush. Often associated with Aboriginal culture prior to invasion, bush tucker is increasingly seeing a comeback. It is recognised for its healthy properties that help fight modern illnesses such as heart disease or diabetes, which is at crisis levels in Aboriginal communities. Bush tucker food that is now used in kitchens includes fruit, nuts, wattle seeds, finger lime, bush tomatoes, strawberry eucalypt leaves, warrigal greens, lemon myrtle, quandong and sea-food besides the commonly known meats such as kangaroo, emu and crocodile. But this new trend comes with challenges as well. Aboriginal people harvesting the foods are often underpaid for the "gruelling work" . Aboriginal people associate rituals and totems with bush foods, an important part when caring for and harvesting them. But non-Aboriginal farmers "don't have any idea about where the seeds have come from or what it actually means," says Rayleen Brown, an Aboriginal woman who runs an Alice Springs catering company . Mark Olive is an Aboriginal chef who has been working in the food business for more than 25 years . Early in his career he developed a strong desire to raise the profile of native Australian foods. His Melbourne-based catering company Black Olive Catering now showcases the best Australian native foods to national and international audiences. He is hosting his own TV show The Outback Café where he shows his creative approach to food. Other Aboriginal-owned businesses offering bush food include Coolamon Food Creations, Kallico Catering and Native Oz Cuisine. An independent report in 2011 found stores licensing in the Northern Territory has helped Aboriginal people in remote communities get better access to healthy, affordable food . During the second half of 2010, 86% of stores were selling at least 13 varieties of fresh vegetables and 91% sold at least 7 varieties of fresh fruit, the report found. In urban areas, the average grocery store carries 200 different kinds of fruits and vegetables . Store management had also improved, including financial management. Many customers appreciated that 'book-up' had been abolished and that there was now more consistent pricing and labeling of goods on shelves. Store profits in some communities are not used to bring down prices, but instead finance cars for a chosen few, an administrative device called ''Motorcar Dreaming'' . Spending store funds on vehicles seems permitted under Northern Territory legislation, provided the vehicles are designated for community rather than personal use--a constraint that is easily bypassed by assigning the cars to "family heads" and not documenting who owns which car. Governments, both national and local, turn a blind eye on the phenomenon because it reduces their pressure to provide public transport to remote communities. 'Book up' is informal credit offered by stores. It allows people to get goods or services and pay the store later. Book up is also known as 'book down', 'on the tick' or 'on the slate'. The system is easy to use, but also causes a few problems, such as too much debt, high fees or passive welfare dependency, and carries the risk of theft or fraud . Some communities therefore decided not to allow book up at all, or have limited its use. A stunningly simple recipe improved the children's health at Baryulgil Public School, 80km from Grafton, NSW . Health officers discovered that all children were deficient in iron and vitamin C and had developed ear (50%) or skin (25%) infections as a consequence. The simple remedy was fresh fruit and vegetables and a strict regimen to ensure they were eaten. Six months later the skin infections were gone and the hearing loss caused by the infection was drastically reduced. Under a Shared Responsibility Agreement families contribute some dollars to the food packages which are now delivered to their communities. "Health problems are way down. The savings in health costs far outweigh the outlay for the scheme," says a campaign leader. Fact You can only eat two of the more than 100 wattles, the black and green wattle seeds. 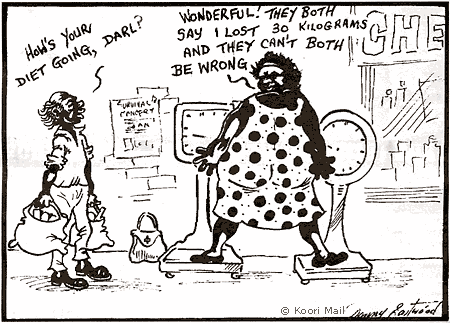 Being overweight or obese is a serious problem that also affects many Aboriginal people. In one community, visits to a dietician and diabetes educator accounted for about 27% of all visits . Targeting obesity and nutrition is a complex process, with many people suffering from more than one ailment, or weight gain combined with mental health issues, alcohol or drug addiction. Another way to alleviate several common medical conditions is setting up a swimming pool. "Swimming pools are one of the simplest and most beneficial infrastructure initiatives that can be provided to Aboriginal communities," says Jay Weatherill when he was South Australian Affairs and Reconciliation Minister . People who use the pool avoid bronchial, skin and ear infections, the latter often leading to hearing and learning difficulties. When a pool opened in the Aboriginal community of Jigalong, 350km south-east of Port Hedland, Western Australia, a subsequent 6-year study found that it had reduced middle-ear infections by 61% and skin infections by 68% . Pools are also a positive, fun and physical outlet for young people, taking them off the streets where they might be vulnerable to substance abuse and crime. Some communities implement a 'no school, no pool' policy  and have seen significant improvements in school attendance. This is a song written by the students of Galiwink'u community school on Elcho Island, about 550 kms north-east of Darwin in north Australia, about the importance of eating traditional bush foods, hunting and living off the land.